Is a Catholic intelligentsia possible in Ukraine? What could be done to help create one? Before we try to answer these questions, we must define our terms. Readers of this journal do not need to be reminded of the definitions of the term “Catholic.” But who are the intelligentsia? Though of Latin origin, the term is modern, and originated in Russia. The word интеллигенция, which gained currency in the 1860s and 1870s, was defined in Dal’ as “разумная, образованная, умствено развитая часть жителей” (Владимір Даль, Толковый словарь живаго великорускаго языка, том 2, С.-Петербургъ-Москва, 1881, передрук Москва, 1979). However, it “came to be associated with a critical approach to the world and a protest against the existing Russian order” (Nicholas V. Riasanovsky, A History of Russia, 2nd ed., New York, 1969, pp. 423-24). In other words, it designated both a group and an attitude. In the Soviet period, however, the Ukrainian word інтелігенція was defined broadly and neutrally as «люди розумової праці, що мають спеціальні знання з різних галузей науки, техніки й культури». There was thus little distinction between “інтелігент,” a member of the intelligentsia, and “інтелектуаліст” – «людина розумової праці». (Академія наук Української РСР, Словник української мови, Київ 1973). The English word “intelligentsia” comes from the Russian, and means “intellectuals who form an artistic, social, or political vanguard or elite.” “Intellectual,” in turn, is defined as a person “given to study, reflection, and speculation” or “engaged in activity requiring the creative use of the intellect.” (Webster’s Seventh New Collegiate Dictionary, 1965). Current use of the term “intelligentsia” seems to vacillate between a broad definition that would include professionals such as physicians and engineers, and a narrow one that would be limited to artists, writers, scholars, philosophers, and political thinkers. Whether current definitions include the clergy is uncertain, though theologians surely qualify. While the term has lost the socio-political connotation it had at its origins, it does retain the notion of a distinct social group. In view of the term’s history, it hardly makes sense to speak of a pre-modern intelligentsia. In the middle ages, what we call the intelligentsia was mostly clerical. Its Christian outlook presupposed the unity of the sciences, which was reflected in the university. As its name implies, this institution, as developed in the high middle ages, taught the “universe” of knowledge. Just as the universe was understood as a system of interrelated parts created by God, so the university conceived of, and taught, knowledge as a system of interrelated disciplines, with theology and philosophy at the center (see generally Alasdair MacIntyre, God, Philosophy, Universities: A Selective History of the Catholic Philosophical Tradition, Lanham, MD, 2009). With the Protestant Reformation, the “Scientific Revolution,” and the “Enlightenment” came a gradual separation of natural science from religion. To a considerable extent, the Catholic Church dropped out of (or was excluded from) European philosophy, and even intellectual life, between 1700 and 1850 (see MacIntyre,op. cit., 135-36). As European and American universities became secularized during the nineteenth century, Catholics often found themselves outside of, and opposed to, cultural and intellectual trends. True, romanticism, as a reaction to Enlightenment rationalism and a revival of sympathetic interest in the middle ages, in some ways favored religion. But trends like positivism, nihilism, naturalism, and materialism worked against it. None of this, of course, had much effect on the masses, which generally remained Catholic or Protestant. That would only change in the following century. Thus, the “long nineteenth century” (1789-1914) saw the rise of a Russian and a western European intelligentsia in many ways at odds with Christian thinking, even if some of its members remained formally members of their respective churches. At the same time, the possibility of a Christian intelligentsia naturally arose. The Oxford Movement that sprang up around John Henry Newman, who later converted to Catholicism, is one example of an active group of Christian intellectuals. But for the most part, it was only the occasional artist who expressed a Christian sensibility contrasting with the temper of the times — in the land of dejected skeptics such as Thomas Hardy (Гарді) and Matthew Arnold, the English Jesuit Gerard Manley Hopkins (Гопкинс) and the troubled poet Francis Thompson; in the fatherland of Karl Marx and Friedrich Nietzsche, the dramatist-musician Richard Wagner; in the anti-clerical France of Auguste Comte and Guy de Maupassant, François-René de Chateaubriand, Paul Verlaine, and Charles Péguy [Пег’і]; in Orthodox Russia, novelists Lev Tolstoy and Fyodor Dostoevsky and poet-philosopher Vladimir Soloviev. In the twentieth century, this dialectic between Christian and secularizing intellectuals continued, though the latter prevailed. Indeed, with the rise of mass communication and mass politics, the secularization of the intelligentsia began to penetrate the masses. Important (at least according to the present-day canon) and influential thinkers like Sigmund Freud (Фройд), Bertrand Russell, and Jean-Paul Sartre, artists like Pablo Picasso, film directors like Luis Buñuel, and novelists from Anatole France (Nobel Prize, 1921) to José Saramago (Nobel Prize, 1998) openly rejected Christianity or religion altogether. Only here and there, now and then, did networks of like-minded thinkers coalesce into clusters of Catholic or other Christian intelligentsia. In the two decades before the revolution, Russian intellectuals experienced a spiritual awakening that sought radical reform in both Church and State. Despite the Bolshevik coup, a constellation of Orthodox thinkers, most of whom emigrated, revived theology as well as philosophical, socio-political, and cultural thought. As a counterpoint to England’s more celebrated Bloomsbury group, the Catholic writers G.K. Chesterton, Hilaire (Гилер) Belloc, and somewhat later J.R.R. Tolkien, as well as Anglicans T.S. Eliot and C.S. Lewis, gave a new impulse to English Christianity, while Christopher Dawson forged a Catholic understanding of history. In secular France, a Catholic intelligentsia developed between the world wars, including theologian Jacques Maritain and the Jewish converts Raisa Maritain, Edith Stein, and Max Jacob. Catholic novelists Georges Bernanos and François Mauriac joined composers Francis Poulenc and Olivier Messiaen. In the years after World War II, such clusters of Catholic intellectuals practically died out, while celebrity-scientists like Carl Sagan and Stephen Hawking (Гокінг’) and popular writers like Christopher Hitchens helped make agnosticism, if not atheism, socially acceptable. Only isolated figures, like American novelists Flannery O’Connor and Walker Percy, British novelist Graham Greene, the reclusive French poet Pierre Reverdy, and British philosophers Peter Geach and his wife Elizabeth Anscombe (both converts), represented the Catholic tradition. In the irreligious and politically leftist world of art, the somewhat erratic Catholicism of surrealist Salvador Dalí and Rusyn-American Andy Warhol was exceptional. Meanwhile, in the Soviet Union a small Russian Orthodox intelligentsia did form around such dissident intellectuals as Alexander Ogorodnikov, Fr. Gleb Yakunin, and Fr. Alexander Men’, while Alexander Solzhenitsyn remained influential after his exile to America. In the 1840s in Russian-ruled Ukraine, an Orthodox Christian native intelligentsia formed around Taras Shevchenko (even if his chief poetic concerns were ethno-social), Panteleimon Kulish, and other members of the Society of SS. Cyril and Methodius. But later, Mykhailo Drahomanov, and Ivan Franko in Austrian-ruled western Ukraine, imported Western European positivism along with socialism, steering the Ukrainian intelligentsia onto a secularizing path. Even after the demise of the Soviet experiment, Ukraine’s intelligentsia has remained mostly secular. This is so despite the survival of a Christian sensibility among some western Ukrainian intellectuals during the inter-war period (notably the poet Bohdan Ihor Antonych), in the postwar diaspora (the poet Vasyl Barka) and, after 1991, in such scattered ex-dissident intellectuals as Yevhen Sverstiuk, Ihor Kalynets, and Myroslav Marynovych. Moreover, the prioritizing of political independence over other considerations – now intensified by the Russian invasion — has tended to eclipse, or appropriate, religious themes. While western Ukrainian intellectuals are generally friendly toward their Church, in central and eastern Ukraine the experience of a Russian Orthodox Church hostile to the national movement has left a lasting distance between intelligentsia and church. This distance appears to be reinforced by secularizing Western influences. Today, with the virtual disappearance of a Christian intelligentsia in the Euro-Atlantic West and its failure to materialize in Ukraine, can there be any prospects for such a phenomenon in the latter country? There is no point in guessing. If Ukraine is to have a Christian culture, it must have a Christian intelligentsia. What can be done to promote one? I propose three paths. First, communication through the internet, including social media, has already created networks of conscious and committed Catholics. These can be diversified so as to separate serious intellectual exchange from merely social applications, and expanded to promote contact with Orthodox intellectuals willing to enter into dialogue with Catholics who share their Kyivan-Byzantine heritage. Second, a Catholic university can provide a focal point for the development of a Catholic intelligentsia. Unfortunately, Western universities do not offer an adequate model. As Alasdair MacIntyre has observed, today’s secular research university is focused on preparation for specialization and professional training, not on education in the true sense. Financially vulnerable and dependent on wealthy donors, it is subject to corporate influence on its academic program. Whereas the late medieval university reflected a philosophical and theological vision of a unified universe (universum), the modern secular research university reflects the lack of such a vision, or a fragmented vision. Thus, subjects and disciplines are not seen as related to each other and forming a harmonious and coherent whole. Philosophy and theology, which should be at the center of the curriculum, are marginalized or eliminated altogether. Thus, a student leaves such an institution with nothing resembling a Christian understanding of the world. A Catholic university (indeed, any true university) would have to be very different. Yet most Catholic universities in the United States mimic the secular research university. (MacIntyre 175, 179). Only here and there, in scattered institutes or small colleges, is anything like a Catholic education to be found. What Ukraine needs, then, is not poor imitations of Harvard, Yale, or Princeton with religious coloring, but true universities which – whether or not they call themselves Catholic or Orthodox – can educate a Christian intelligentsia. The third path is through publications, both print and electronic. Historically, journals offering social, cultural, political, and economic criticism from a Christian viewpoint, sometimes combined with philosophical and theological discussion, have served as gathering points for Catholic and other intellectuals. T.S. Eliot’s interwar Criterion, while not formally religious, succeeded in promoting traditional Christian thought and culture. 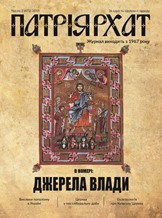 The Russian émigré journal «Путь», published in Paris in the same period, did the same for Orthodoxy. More recent Catholic examples are the Polish Znak and Więź, the British Tablet, and the American First Things and Image. The journal in which this article appears could certainly play such a role in Ukraine. By connecting thinkers, writers and readers with each other, such journals create a community, which with time can develop into an intelligentsia.